With the Saved Exports tool, you can create custom SQL queries to export information from your store's database. In our example below, we'll export the total number of orders for each customer as well as the total number of customers who have placed orders. We'll export this data to a CSV file which can be imported into a standard spreadsheet program such as Microsoft Excel. In your Admin Area, go to Inventory > Import/Export. Click on the Saved Exports tab. Configure your custom query and save your changes when finished. 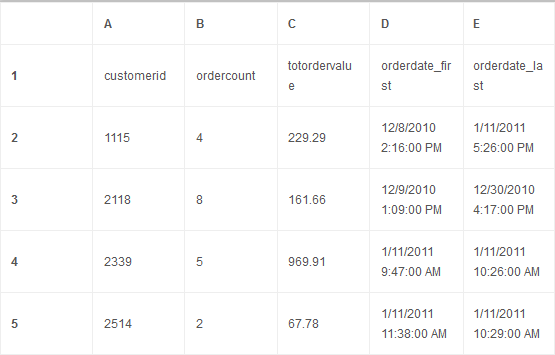 See the table below for an example query that will export the order information as described at the beginning of the article. Use this example as a starting point for more complex queries that you can save and use with your site. Once you've configured the query in the Saved Export page, you can run the query by selecting it from your Saved Exports, selecting CSV from the File Format drop-down, and clicking Export. Once the export is complete, you can download your exported data from the resulting page. For more information, see the complete Import / Export user guide.